The lowdown: “Saison” sounds fancy—dainty even. It’s nearly impossible to order one without indulging in even the lightest French lilt. That might, to the casual beer drinker, make them appear less approachable. But there’s a reason saisons are also known as “farmhouse” beers. Their roots are humble. The saison’s seasonality presented a challenge, with brewers tasked to create a beer that was both light enough for casual consumption and robust enough to hold up throughout the summer. This led to experimentation, as well as the discovery of the saison’s most enduring trait: its adaptability. Farmers were beholden to that season’s crop rotation, meaning their beers were made with barley, wheat, rye, spelt, and whatever else was at hand, from hops to spices. Every barrel, therefore, was a little bit different. That spirit perseveres to this day. Typically, saisons share a common style of yeast and a high-temperature fermentation process, but the rest is, as some say, a moveable feast, a blank canvas upon which to paint your masterpiece. This sense that there are no rules—coupled with the publication of Phil Markowski’s Farmhouse Ales: Culture And Craftsmanship In The Belgian Tradition in 2004—emboldened American brewers to experiment with their own styles. That experimentation makes saisons incredibly difficult to categorize. Some are earthy, some are sour, and some incorporate fruit, rye, and even floral notes. It’s why saisons have been called a “philosophy” as much as a style. More than any other beer, it represents an ideology, an expression of the strengths and personality of its particular brewer. 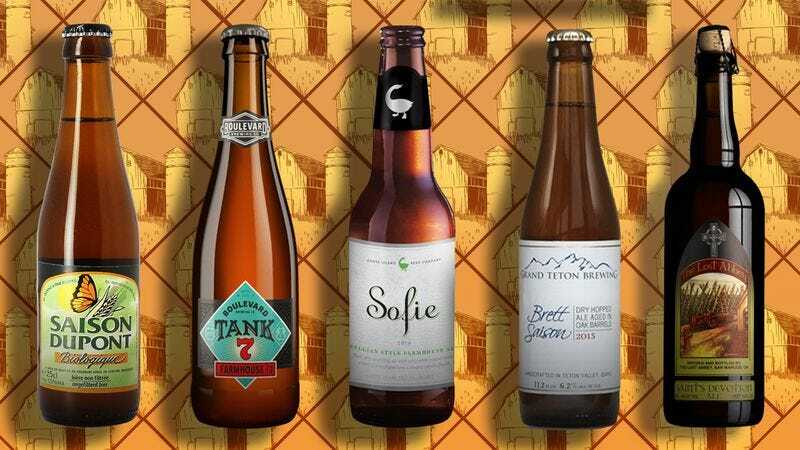 The taste: Each saison is different, but experts can agree that the modern saison is usually dry with a light fruitiness and high level of carbonation. Spiciness is another signature flavor, as the yeast tends to yield its own piquant character, which brewers often augment with spice blends that can include peppercorns, coriander, ginger, and whatever else is on the rack. That spice tends to foreground the aroma alongside hints of pilsner-style malt and fruit. You may also get a touch of earthy, barnyard funk in the finish. Often described as “horse blanket,” this flavor hearkens back to the saison’s farmhouse roots, and gives the beer much of its character. Still, even the most complex saisons were designed for light, easy drinking, so be wary of any style that favors aggression over flavor. Any bitterness from the hops should be subdued. The mouthfeel should be smooth and sweet, and the finish crisp and quenching. The gateway: Saison Dupont, out of Belgium’s Brasserie Dupont, is the industry’s oldest and most revered saison for a reason. The current recipe dates back to the 1920s, while the beer itself was first brewed in 1844. Impeccably balanced, the beer is dry, crisp, and just the slightest bit bitter due to its high carbonation and hoppy middle. The yeastiness is evident, and it works in tandem with a bite of pepper to give the beer its robust character. Still, it goes down smooth, making it an ideal introduction to the flavors of your standard saison. Better yet, Saison Dupont is brewed to keep re-fermenting in its bottle. This sustains the beer as it travels from the brewery to your doorstep, maintaining its character and freshness. If you’re already accustomed to the hop-forward presence of IPAs, Boulevard’s Tank 7 could make your transition into saisons that much easier. Tank 7 is a distinctly American take on the saison, balancing the funkiness of its Belgian yeast with a pronounced citrusy hop bitterness. Like Saison Dupont, Tank 7 is a fairly consistent fixture in most craft beer sections. The next step: Once you’ve become accustomed to the yeasty, funky, peppery flavors of your standard saison, seek out some of the brewing world’s more innovative takes on the style. Carton Brewing Co.’s Eden, for example, summons the flavors of Asia with aromas of jasmine and grains of paradise, while Goose Island’s Sofie achieves a sparkling, champagne-like body by aging the beer in wine barrels. Another emerging trend in saisons is the incorporation of Brettanomyces, a strain of wild yeast that greatly amplifies the natural barnyard character of Belgian beers. “Brett” beers are bold and often sour, and can be tremendously complex and satisfying when executed well. An easy introduction to the Brett style is Lost Abbey’s Saint’s Devotion, a saison that tempers the Brett’s funk with citrus and a crisp, heavy blast of hops in the finish. Another hop-forward selection is Grand Teton’s Brett Saison, which achieves a rare complexity by combining two different strains of Brettanomyces in addition to aging the beer in wine barrels. It sounds heady, but a medium ABV of 6.2 percent keeps it approachable.